What else is new in EQ8? 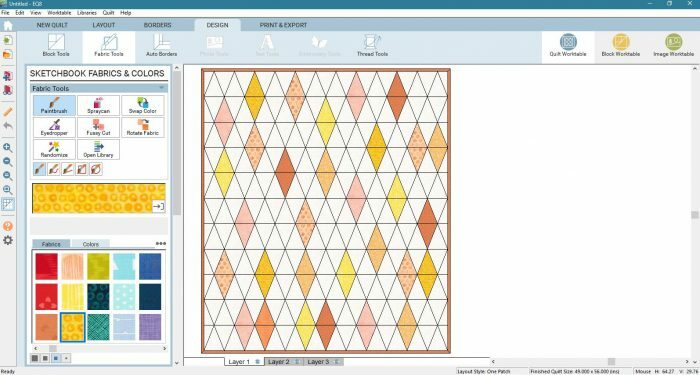 If I use the swatch as it is, can you see the lines that are created when the swatch is tiled inside the quilt? … and re-scale the swatch to its actual size. Now look at how much better the fabric looks when it is placed in the quilt! Patches, blocks, and borders all have outlines so we can see their boundaries. But the reality is that quilts do not have black lines surrounding each of these elements. 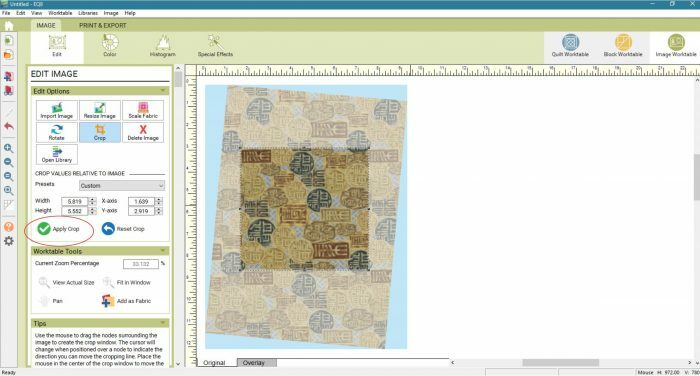 Turning off these outlines in EQ7 involved right-clicking on the quilt and unchecking Outline Patches, Outline Blocks, and Outline Border one at a time. EQ8 has added an easy outline on/off button right on the toolbar. 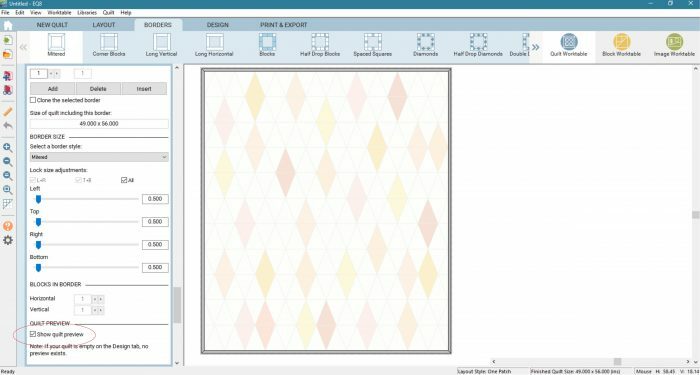 When you design quilt borders in EQ7, only the block outlines in the center of the quilt are visible. 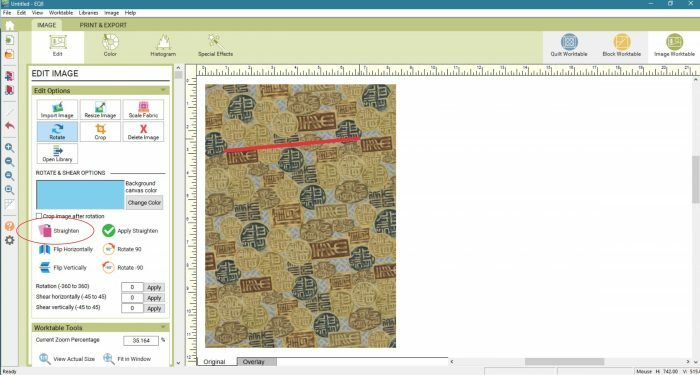 Any blocks or fabrics that have been placed in the design cannot be seen on the Border tab. 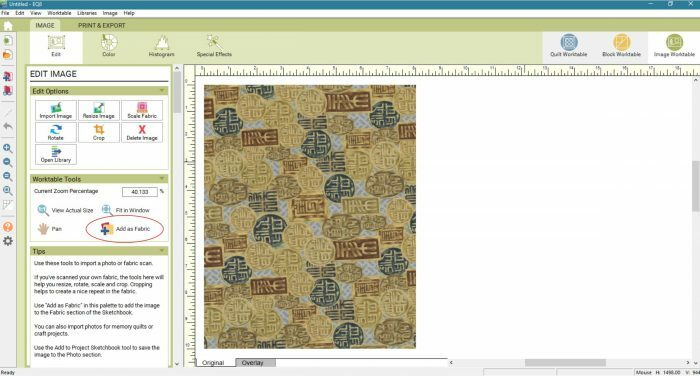 EQ8 has added a Quilt Preview option on the Border tab. 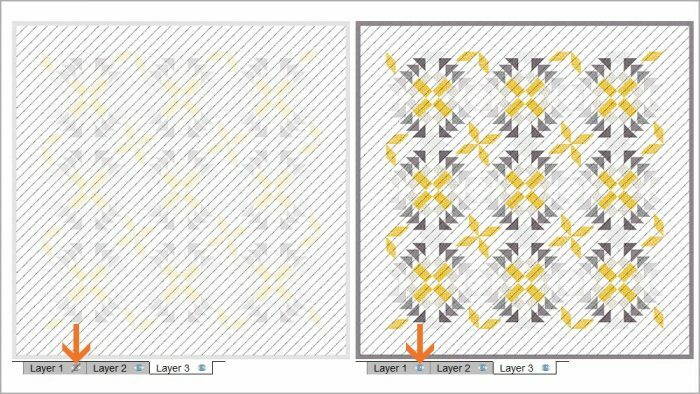 Similarly, quilt layers can be turned on and off while designing. Layer 1 is for fabric, layer 2 is for appliqué and layer for 3 is for thread. It can get confusing looking at all the layers at once! Use the Eye icons to hide layers 2 and 3 while making edits to Layer 1. 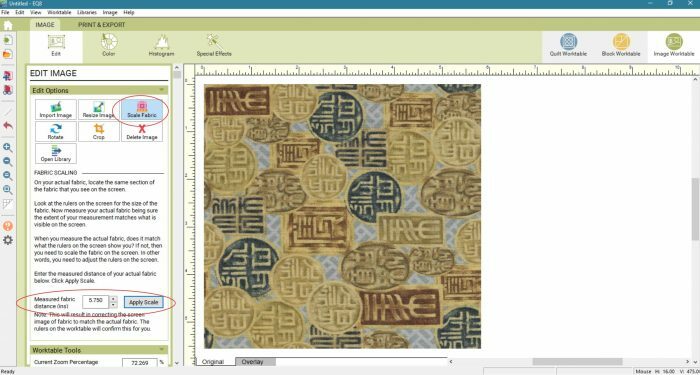 See a washed out preview of Layer 1 while designing on Layers 2 and 3 so you can still get perfect placement of your motifs and stencils. 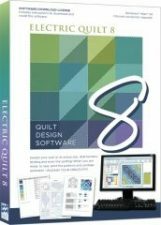 To read more about the new features in EQ8, please visit The Electric Quilt Company website. Back in June 2010, I wrote: “I can’t honestly say that I was missing anything in EQ6 or wishing for anything in EQ7, but I was still pretty excited to install my upgrade this past week.” The same is true today. I thought EQ7 was great just the way it was, but then they went and made it better! If you already have EQ7, I hope you will be able to take advantage of the discounted upgrade price. 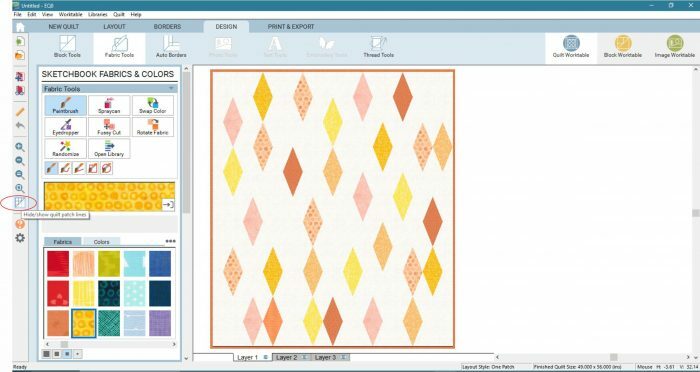 If you haven’t been using quilt design software, maybe now is the time to give it a try. It is easier to learn than ever before!